Migraines are horrible, but if you suffer from them we don’t have to tell you that. Some people suffer nausea or dizziness, while others are sensitive to light or sound. The pain can go beyond the head and into the face and neck. And, of course, there’s the pain in the brain itself, which can range from a dull throb to severe and sharp stabs. If you’re tired of migraines and the medicines aren’t helping as much as you’d like, it might be time to give chiropractic care a try. It’s been known in the industry for quite some time that careful manipulation of the spine can help prevent and treat migraines in some people. Let’s take a look at the specifics. Those who believe in the power of chiropractic often view it as a preventive measure in order to deal with pains throughout the body before they begin. Our bodies can stand up to the wear and tear of the world we live in much better if they are properly aligned in the first place. This article from Migraine.com discusses a study that involved headaches as a whole, including migraines. The study found that preventative chiropractic care can indeed help in the prevention of typical headaches as well as migraines, which are a more all-encompassing, body-wide malady. 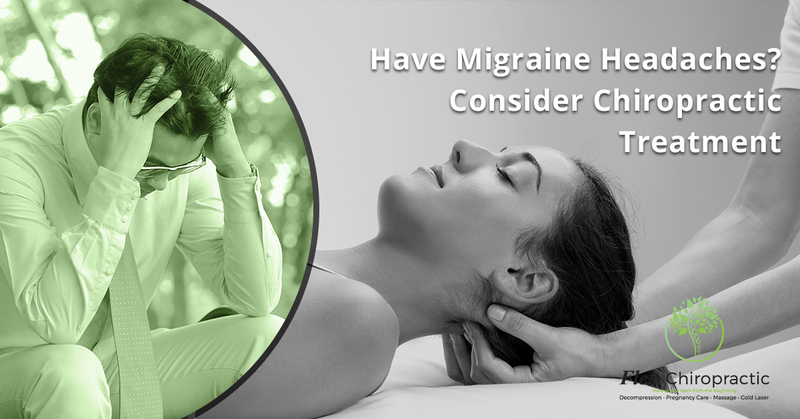 While the group of people who received chiropractic as a preventive measure showed promises, chiropractic care has also been shown to reduce the pain associated with migraines. While most people don’t come in during a migraine, we do see people come in at points of their lives that they’re more susceptible to them. For instance, if a person has had three migraines recently, they often see fewer of them after they see us. Does chiropractic care always work for migraines? Unfortunately not. But approximately half of the people who receive chiropractic care report a significant reduction in the amount of pain and the frequency they get migraines. Those are pretty good odds if you’re interested in reducing the pain associated with migraines. Many people who have chiropractic treatments in response to migraines report that they don’t need to take as many medications after the treatment. In other words, they are less reliant on painkillers as a way of dealing with migraines. Using less medication is good for the body and for the environment, not to mention the way it can reduce spending on medicine. If you’ve been to a doctor recently, it’s likely that they’ve given you some tips on how to improve your health. Eat healthier, get more exercise, and find ways that you can reduce stress in your life. Since we don’t dispense prescriptions, chiropractors tend to be even more interested in dispensing such healthy advice. We know that migraines aren’t something that you choose to have, but we might be able to help you pinpoint the things that trigger them. We’ll treat you to ensure your body is working for you and not against you when it comes to dealing with migraines. Could Chiropractic Help Your Migraines? If you’ve never tried chiropractic care before, you might be skeptical about it helping your migraines. But when you think about it, you don’t have much to lose and everything to gain. If a few trips to a chiropractic clinic in Columbia or Lexington can reduce the number of migraines you get, isn’t it worth a try? We’ve see it work in both clinics and we’d love to alleviate some of your pain. We’d love to help you!